This item is 4 years and 4 months old; some content may no longer be current. The best method for treating patients with an ingrown toenail has long been debated. Non-surgical options are generally preferred for patients with mild-to-moderate symptoms, and surgical options preferred in patients with more severe symptoms. However, there is limited evidence available regarding the effectiveness of non-surgical treatments. Recent evidence suggests that some surgical techniques are associated with very low recurrence rates of the ingrown toenail, and therefore should be considered more often, despite being a more invasive treatment. Patients with an ingrown toenail most frequently present with pain, redness and swelling, the severity of which depends on the stage of the ingrown toenail (Table 1) and whether any infection is present. Although clinical staging of an ingrown toenail is not always necessary, being aware of the different stages can help in selecting the most appropriate treatment. Diagnostic tests are not usually required, but if a particular cause is suspected appropriate tests can be ordered, e.g. nail clippings and scrapings of subungual debris for fungal culture and microscopy. In general, conservative treatments can be trialled in patients with a first presentation of an ingrown toenail with mild symptoms, in those who do not want to have surgery and in those at an increased risk of surgical complications. Patients with more severe symptoms or with an ingrown toenail that has not responded to conservative treatment can be considered for surgical options. A 2012 Cochrane review reported that surgical interventions are generally more effective in preventing recurrence of an ingrown toenail than non-surgical treatments.5 However, the review did not define which stages of ingrown toenails were included in the trials and the results are likely to be more applicable for patients with a moderate-to-severe ingrown toenail. Two (moderate) Increased erythema, oedema and pain which may be associated with white or yellow coloured pus or drainage from the area. Lateral nail-fold hypertrophy becomes apparent. Three (severe) Further increase in erythema, oedema and pain with formation of granulation tissue which can add to pus formation and more significant infection. Lateral nail-fold hypertrophy is more prominent. There are a number of general measures and conservative treatments that can be considered in patients with a mild ingrown toenail. Applying silver nitrate to cauterise the granulation tissue and reduce the skin fold bulk. This can, however, be a slow process and it may be more effective to remove the granulation tissue later if surgery is undertaken. People with a fungal toenail infection have an increased risk of developing an ingrown toenail as the fungal infection causes the toenail to become thickened. Patients often require treatment with an oral antifungal, e.g. terbinafine or itraconazole, or a topical antifungal, e.g. amorolfine or ciclopirox, in combination with the ingrown toenail treatment. For further information, see “Management of fungal nail infections” BPJ 19 (Feb, 2009). Inappropriate toenail trimming is associated with the formation of ingrown toenails and conventional advice to prevent this is for toenails to be cut straight across rather than curved.5 However, this advice has been challenged more recently. 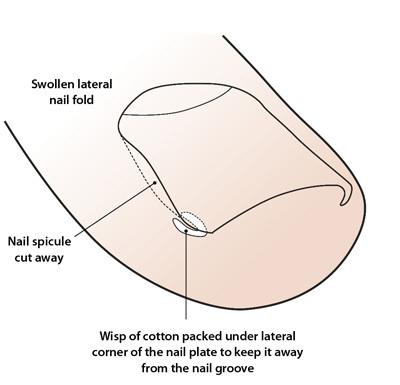 A study that investigated two different surgical techniques in patients with an ingrown toenail reported that the toenail cutting method (straight vs. curved) was not a significant factor in ingrown toenail development.6 The overall shape of the nail is determined by the growing area at the nail matrix. Patients with mobility or flexibility problems or very thickened nails may need to be referred to a podiatrist for nail cutting. There are a number of non-surgical options available that target either the ingrown toenail itself or the surrounding nail folds. The aim of conservative treatment is to separate the ingrown part of the toenail from the surrounding nail fold. The cotton wick method is the most commonly performed of these methods in general practice. The cotton wick (packing) method: Involves elevating the lateral edge of the toenail and inserting a small piece of cotton wick (which can be soaked in disinfectant or antiseptic) under the edge of the nail to prevent it digging in to the surrounding tissue (Figure 2).4 The procedure can generally be performed without the use of a local anaesthetic. If necessary, silver nitrate can be used to cauterise any surrounding granulation tissue. Be aware that silver nitrate is corrosive and stains both the toenail and surrounding tissue black. Patients usually report immediate relief of pain after the procedure. The patient can be instructed to repeat the process once, or if necessary, twice daily, or if the cotton falls out. It is generally recommended that the cotton wick only remain in place for approximately one week as distal subungual onychomycosis can develop if the cotton wick is left in for a prolonged period. Dental floss technique: This technique is similar to the cotton wick method except that a string of dental floss is used to separate the toenail and the nail bed rather than a cotton wick. The dental floss is inserted obliquely under the corner of the ingrown toenail and pushed proximally. The procedure is usually performed without a local anaesthetic. It has been reported that patients experience immediate relief of pain, followed by growing out of the spicule without injury to the nail fold.9 The dental floss is usually left in place until the lateral anterior tip of the of the nail plate reaches the hyponychium (Figure 1).9 The dental floss should be replaced if it becomes dirty or falls out before this occurs. Taping method: This technique is the least invasive of all the conservative non-surgical treatments and uses an adhesive elastic tape, e.g. 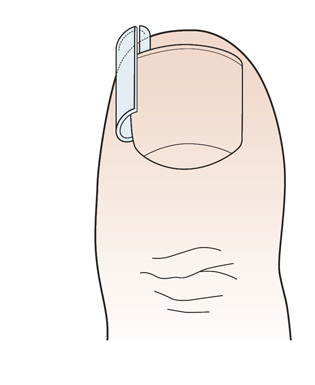 strapping tape (approximately 15 – 20 mm wide and 5 cm long), to pull the lateral nail fold away from the ingrown toenail (Figure 4).7 One end of the elastic tape is placed against the ingrown nail alongside any granulation tissue (if present) and then wrapped around the toe so that the other end overlaps the first without covering the toenail.11 The exact taping technique is crucial and patients will require specific instruction about how to perform it.7 It is generally recommended that the affected toe is re-taped every three to seven days (or when the tape becomes ineffective) for at least two months. Angle correction technique: This technique aims to correct the convex nature of the toenail by filing the entire surface of it with the intention of decreasing its thickness by 50–75%. The process is then repeated by the patient every two months making the nail thin and soft which reduces the pressure on the nail fold. A Blacks file (a specialised nail file – see “Toenail cutting”) can then be used to reshape the edge of the nail. Patients need to be educated about the importance of not removing too much of the toenail as this can result in pain when pressure is placed on the nail. This procedure is performed under a partial ring block with 1% plain lidocaine injected at the base of the toe. As the major innervations to the nail plate are the plantar digital proper nerves, the majority of the local anaesthetic should be placed on the plantar aspect of the digit. A three-sided ring block is recommended as a four-sided block is associated with a risk of ischaemia.14 A ring tourniquet is applied to the toe followed by longitudinal removal of the outer part (usually 3 – 5 mm) of the affected toenail, including the nail matrix. Segmental ablation of the exposed toenail matrix is then performed using liquefied phenol. There is some debate about the length of time that the phenol should be applied for, but two 60-second applications appears to be most widely used.1 Other studies have reported that phenol only needs to be applied for 60 seconds in total, which can be split into three 20 second applications.15 The applications should be separated by a washout with saline (alcohol is often used but is unnecessary) and this should be repeated after each application of phenol.1 The area should be dried with a cotton wool swab prior to each application of the phenol to reduce the chance that the phenol will be diluted with blood or saline. Postoperative care: The patient should be advised to keep their leg elevated for 24 – 48 hours while seated and avoid wearing a shoe on the affected foot for approximately three days. Antibiotics are not routinely required as it has been reported that postoperative antibiotic prophylaxis does not reduce the rate of postoperative infection or recurrence of the ingrown toenail.5, 6 The patient can remove the dressing on the day after surgery and soak the affected foot in warm water containing Epsom salts, twice daily, for approximately one week. Table salt (one to three tablespoons per litre of water) can be used as an alternative to Epsom salts. Patients may require analgesia, e.g. paracetamol +/- codeine or ibuprofen, for two to three days. Follow-up check of the site at one week is recommended (Figure 5). This procedure involves extensive removal of the periungal nail fold while leaving the toenail itself intact. 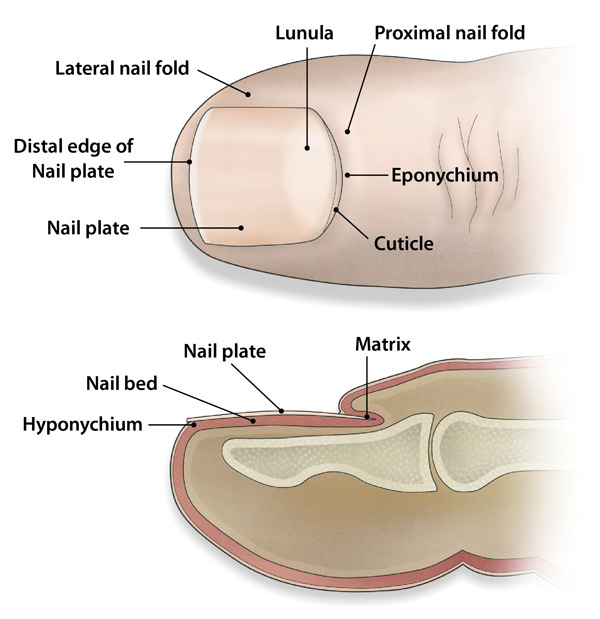 The procedure is performed under a three-sided ring block of the affected toe and involves making a large elliptical incision on each side of the nail and removing the relevant lateral skin folds. It is important that the excision is generous and adequate (leaving a soft tissue deficiency of approximately 1.5 × 3 cm). Light cauterisation with either silver nitrate or electrocautery is then performed and the wound is left to heal by secondary intention.8 A gauze dressing should be applied. N.B. The Vandenbos technique is not recommended in patients with diabetes as poor blood supply can delay healing. Partial nail avulsion with phenol ablation is recommended in these patients. Instructional videos for many of the surgical procedures for treating ingrown toenails can be found on YouTube. Thank you to Dr Daniel Poratt, Podiatric Surgeon, Senior Lecturer in Podiatry, Auckland University of Technology and Dr Amanda Oakley, Specialist Dermatologist, Clinical Associate Professor, Tristram Clinic, Hamilton for expert review of this article. Park DH, Singh D. The management of ingrowing toenails. BMJ 2012;344:e2089. Heidelbaugh JJ, Lee H. Management of the ingrown toenail. Am Fam Physician 2009;79:303–8. Richert B. Surgical management of ingrown toenails - an update overdue. Dermatol Ther 2012;25:498–509. DermNet NZ. Ingrown toenails. DermNet NZ, 2013. Available from: www.dermnetnz.org/hair-nails-sweat/onychocryptosis.html (Accessed Nov, 2014). Eekhof JAH, Van Wijk B, Knuistingh Neven A, et al. Interventions for ingrowing toenails. Cochrane Database Syst Rev 2012;4:CD001541. Bos AMC, van Tilburg MWA, van Sorge AA, et al. Randomized clinical trial of surgical technique and local antibiotics for ingrowing toenail. Br J Surg 2007;94:292–6. Haneke E. Controversies in the treatment of ingrown nails. Dermatol Res Pract 2012;2012:783924. Chapeskie H, Kovac JR. Case Series: Soft-tissue nail-fold excision: a definitive treatment for ingrown toenails. Can J Surg 2010;53:282–6. Woo S-H, Kim I-H. Surgical pearl: nail edge separation with dental floss for ingrown toenails. J Am Acad Dermatol 2004;50:939–40. Schulte KW, Neumann NJ, Ruzicka T. Surgical pearl: nail splinting by flexible tube--a new noninvasive treatment for ingrown toenails. J Am Acad Dermatol 1998;39:629–30. Manca D. Practice tips. Taping toes. Effective treatment for ingrown toenails. Can Fam Physician 1998;44:275. Nishioka K, Katayama I, Kobayashi Y, et al. Taping for embedded toenails. Br J Dermatol 1985;113:246–7. Erdogan FG. A quantitative method for measuring forces applied by nail braces. J Am Podiatr Med Assoc 2011;101:247–51. Family Practice Notebook. Digital Block. Available from: www.fpnotebook.com/surgery/pharm/DgtlBlck.htm (Accessed Nov, 2014). Boberg JS, Frederiksen MS, Harton FM. Scientific analysis of phenol nail surgery. J Am Podiatr Med Assoc 2002;92:575–9. Ogur R, Tekbas OF, Hasde M. Practice tips. Managing infected ingrown toenails: longitudinal band method. Can Fam Physician 2005;51:207–8. Vandenbos KQ, Bowers WF. Ingrown Toenail: A result of weight bearing on soft tissue. US Armed Forces Med J 1959;10:1168–73. Chapeskie H. Ingrown toenail or overgrown toe skin? : Alternative treatment for onychocryptosis. Can Fam Physician 2008;54:1561–2. This article is 4 years and 4 months old.